Alexander “Tig” Trager is a fictional character on the FX television series Sons of Anarchy, played by Kim Coates. Kim Coates (born February 21, 1958) is a Canadian-American actor who has worked in both Canadian and American films and television series. He has worked on Broadway portraying Stanley Kowalski in A Streetcar Named Desire and in the lead role of Macbeth performed at the Stratford Shakespeare Festival. He currently stars as Tig Trager in the FX series Sons of Anarchy. 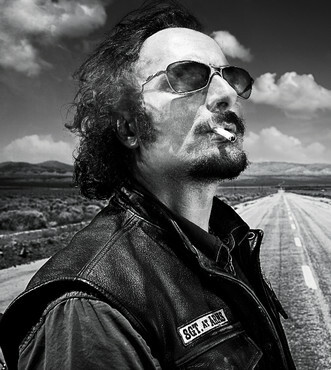 Tig Trager was the Sergeant-at-Arms of the Sons of Anarchy Motorcycle Club's Charming, California chapter and is the gang's most violent member. He was extremely loyal to Clay Morrow, the club's former President, Clay's wife Gemma, and the club itself. He has at times had a strained relationship with the current President, Jax Teller, arising from his use of violence in situations which may not call for it. Not much is mentioned about Trager's past, but it is likely that he is a native of Charming and that he has served time in prison. It is explained in a behind-the-scenes video from Season One that he was a U.S. Marine. He is in his late 40s or early 50s and was the Sergeant-at-Arms of the Sons of Anarchy Motorcycle Club's Mother Chapter, the responsibilities of which include: to ensure proper employment, defense, and enforcement of club rules, charter bylaws, and chapter decrees, and imposition of penalties for violations thereof are observed, executed, and fulfilled. His “day job” is working as a mechanic at the Teller-Morrow Automotive Repair shop, and he is often used by the gang to carry out killings. He has two daughters, named Dawn and Fawn, whom he sees a couple of times each year. He suffers from acute pediophobia, a fear of dolls, which Sons of Anarchy creator Kurt Sutter actually has. In the Season One episode “Old Bones”, he explicitly says that he is a necrophiliac, and describes to Clay what he likes about it, while at the morgue. It remains unclear whether Tig was being serious, or simply used the opportunity to enhance his reputation for embracing the gruesome and the macabre. Several times he is hinted to have a proclivity for other paraphilia's. Tig is frequently employed in situations where the use of violence is needed. Far from shying away, Tig actually seems to enjoy and covet his position as an enforcer, relishing the art of dirty fighting and the use of sudden, vicious, and often extreme violence. A trademark tactic is for him to bite off a piece of flesh from a rival during a fight.